The cards that we issue are VISA. Please be informed that per new card issuer’s terms, both plastic and virtual VISA cards are available only for European residents. 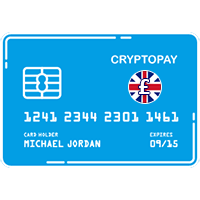 At the moment we are doing our best to find a way to issue and deliver Cryptopay cards to the Russian Federation. When they are available for the residents of your country, we will definitely let you know. “Формат карт которые мы выпускаем платежной системы VISA. Доводим до вашего сведения, обе пластиковая и виртуалная карты VISA доступны ТОЛЬКО для резидентов Европы.